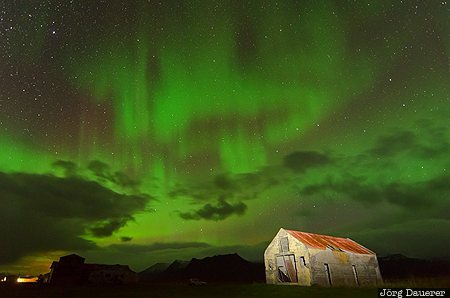 Aurora Borealis (also known as Polar Light or Northern Light) above the Snæfellsnes Peninsula with a small decaying wooden shack in the foreground. The Snæfellsnes Peninsula is in Vesturland in the west of Iceland. This photo was taken in the night of a cloudy day in September of 2013. This photo was taken with a digital camera.